We Can Help You To Speed Up & Secure Your Websites! With our exclusive partnership with CloudFlare, we are able to offer the amazing Railgun technology to speed up delivery of non-cached content in addition to static content. Once your website is a part of the CloudFlare CDN, its web traffic is routed through their intelligent global network of 80+ worldwide POP’s (and growing). The delivery of your web pages will be automatically optimized so your visitors get the fastest page load times and best performance. Threats and abusive bots & crawlers will be blocked from wasting your bandwidth and server resources as well as influencing your website’s performance. The result: CloudFlare-powered websites see significant improvement in performance and decrease in spam and other attacks. Fast responsive times globally and near-instant updates. We are happy to announce a new partnership with CloudFlare, the web’s easiest and most effective performance and security solution. As a CloudFlare Optimized Partner, we deliver their simple, yet effective solution to help protect and accelerate your website. Once your website joins the CloudFlare CDN, it loads twice as fast and is protected from a range of online threats. Getting started is super easy — you just need to log into your control panel and look for the CloudFlare service icon. With two clicks, you can activate CloudFlare powered hosting and your website will automatically be faster and safer around the world. Railgun ensures that the connection between our network and the CloudFlare network is as fast as possible. Railgun achieves a 99.6% compression ratio for previously uncacheable web objects by using techniques similar to those used in the compression of high-quality video. An average website can expect a 1.43x performance increase. When a request is made to a CloudFlare’s server for a web page that is not in cache CloudFlare makes an HTTP connection to the origin server to request the page. It’s that HTTP connection that Railgun accelerates and secures. CloudFlare Railgun works by recognizing that uncacheable web pages do not change very rapidly. For example, during an experiment, the CNN.com homepage HTML was captured once, and then again after 5 minutes and then again after one hour. The page sizes were 92,516, five minutes still 92,516 and one hour later 93,727. CloudFlare Railgun technology consists of two components: the sender and the listener. The sender is installed at every CloudFlare data center around the world. The listener is a software component that Softsys Hosting has installed on our network for customers. The sender and listener establish a permanent TCP connection that’s secured by TLS. This TCP connection is used for the CloudFlare Railgun protocol. It’s an all binary multiplexing protocol that allows multiple HTTP requests to be run simultaneously and asynchronously across the link. Or in other words, a persistent connection is opened between CloudFlare’s CDN network and ours and eliminates the overhead of TCP. We have made it simple for our customers to get the benefits of Railgun with one click. For additional information and instructions on how to activate, visit our knowledgebase. 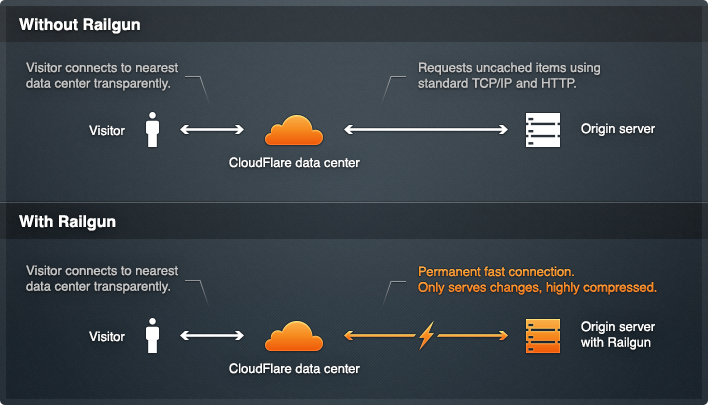 HOW DOES CLOUDFLARE INCREASE SPEED AND SECURITY OF YOUR SITE? Simply put, CloudFlare will make any website twice as fast and protect it from a broad range of web threats. Today, hundreds of thousands of websites—ranging from individual blogs to the websites of Fortune 500 companies and national governments use CloudFlare to make their sites faster and more secure. They power more than 65 billion monthly page views — more than Amazon, Wikipedia, Twitter, Zynga, AOL, Apple, Bing, eBay, PayPal and Instagram combined — and over 25% of the Internet’s population regularly passes through CloudFlare’s network. 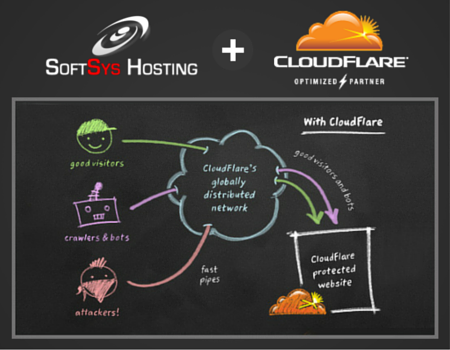 CloudFlare is designed to take a great hosting platform like Softsys Hosting one and make it even better. CloudFlare has 80+ data centers strategically located around the world. When you sign up for CloudFlare, your website traffic will begin routing to the nearest data center. CloudFlare’s intelligent caching system also means you save bandwidth, which means saving money, and decreases the load on your servers, which means your web application will run faster and more efficiently than ever. On average, CloudFlare CDN users see 60% decrease in bandwidth usage, and 65% in total requests to their servers. The overall effect is that CloudFlare will typically cut the load time for pages on your site by 50% which means higher engagement and happier visitors. 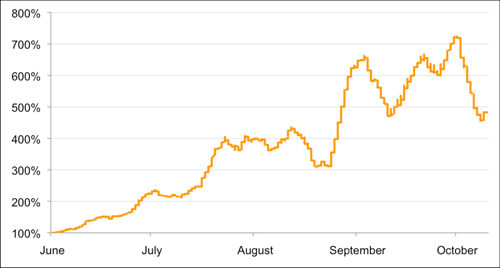 Over the course, CloudFlare identified a 700% increase in the number of distributed denial of service attacks (DDoS) that they track on the Internet (see the chart below). 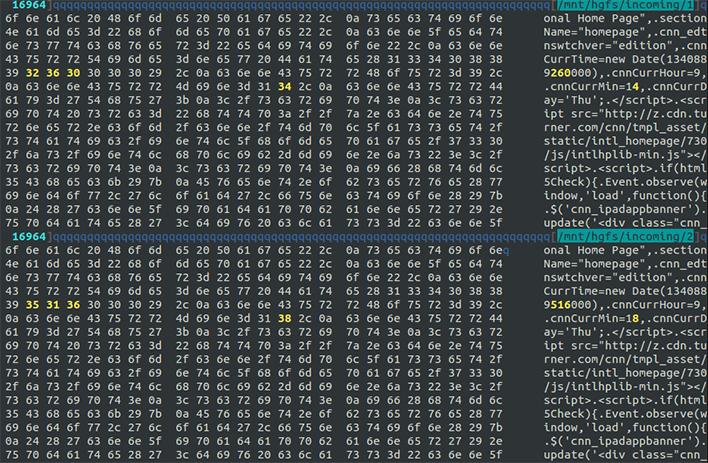 As attacks like these increase, CloudFlare is stepping up to protect sites. CloudFlare CDN offers a broad range of protections against attacks such as DDoS, hacking or spam submitted to a blog or comment form. What is powerful about the approach is that the system gets smarter over time. CloudFlare CDN system analyzes the traffic patterns of hundreds of millions of visitors in real-time and adapts the security systems to ensure good traffic gets through and bad traffic is stopped. Any website can deploy CloudFlare, regardless of your underlying platform. By integrating closely with Softsys Hosting, the process of setting up CloudFlare is just “1 click easy” through our members portal dashboard. Just look for the “Setup CloudFlare” floating button, create a CloudFlare account or use existing one, update name servers to the CloudFlare ones and that’s it! The pricing for CloudFlare powered hosting plans have been kept to the lowest possible and you are never charged for bandwidth or storage, therefore saving you a fortune via reduced bandwidth costs. You can have your website hosted on Windows VPS in our network & use CloudFlare Railgun. Protect & Speed up your website hosted on our Linux VPS plans – CentOS, Debian, Ubuntu, etc. Host your website on our powerful bare metal servers & use CloudFlare with them for great speed & security.